This post is the first in a series that will highlight innovative strategies and tools designed to help increase and diversify the supply of quality rental housing in opportunity and priority reinvestment areas. Businesses, families, and communities succeed when children can attend good nearby schools and parents can enjoy an easy commute to work. Yet neighborhoods with that kind of access to opportunity are typically unaffordable to local workers and others with limited means. Many local and regional leaders are developing responses to this challenge. Over the course of this year, Brookings Metro is convening a Community of Practice on Regional Housing Solutions, bringing together a diverse array of partners from the Baltimore, Chicago, Kansas City, and Minneapolis-Saint Paul regions to share best practices, troubleshoot common challenges, and develop policy solutions that increase access to opportunity through regional housing efforts. Imagine a family of four searching for a two-bedroom apartment in the Chicago region. Let’s call them the Millers. Mr. and Mrs. Miller work in the city’s well-off northwest suburbs, in two of the fastest-growing employment sectors in Illinois. Mrs. Miller is a full-time customer service representative and Mr. Miller works part-time as a cashier while the kids are at school. Together the couple earns $38,000 a year, or 50 percent of what the typical Chicago-area family earns. The Millers want an easy commute from a neighborhood with high-quality schools and hope to spend less than the recommended 30 percent of their income—roughly $950/month—on housing. But the Millers are unlikely to find an affordable home near a good school. 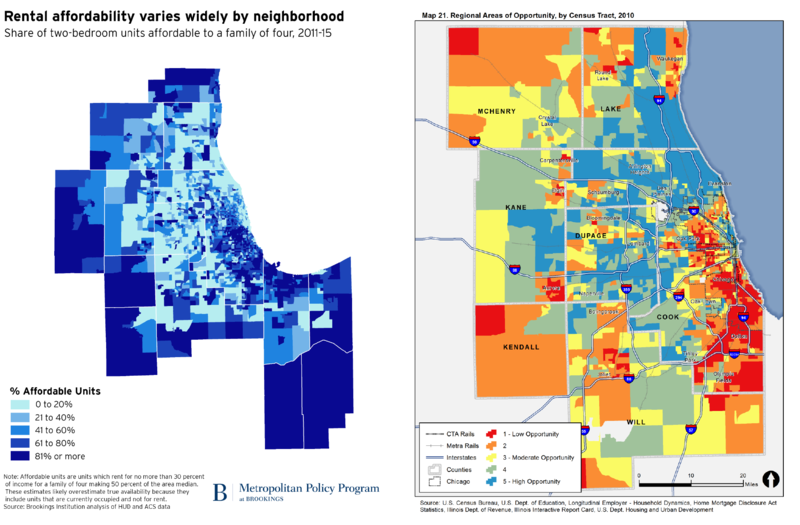 Although about half of two-bedroom rentals in the Chicago metro area would work within the Millers budget, according to Census data (see the map on the left), those options are primarily located outside “opportunity areas” (see the map on the right, developed by the Chicago Metropolitan Agency for Planning to identify areas with access to good schools, jobs, transportation, and other key amenities). Areas that do offer more access to opportunity tend to have tight rental markets and few vacancies. If the Millers narrow their search to the city of Chicago or places like Naperville or Elgin, their options are even more limited. Obviously the affluent suburbs are out of reach, but if the Millers turn to the lower-cost suburbs, they face higher transportation costs, diminished job access, and limited availability of other services. Clearly, these challenges are not unique to the Chicago region. In 2015, almost half of renter households (48 percent) in the United States experienced a housing cost burden, meaning they spent more than 30 percent of their income on housing. And the lower a renter household’s income, the fewer choices they have: there were just 35 housing options affordable and available to every 100 renters with extremely low incomes in 2015. Shortages are worst in large, urban counties that anchor many of the nation’s largest metro areas, but pressures have also been increasing in suburban communities where poverty has grown rapidly in recent years. These stark statistics do not take location into account—and of course, neighborhood matters. Just as regional housing disparities interfere with the recruitment of workers and a firm’s performance, the propensity for rental housing to cluster in higher-poverty neighborhoods bodes ill for the long-term outcomes of children growing up in those communities. And the children of families that overcome these barriers by moving into better neighborhoods experience the long-term benefits. Together, these realities mean that policymakers, practitioners, funders, advocates, and other stakeholders must focus not only on boosting the supply of rental housing to ease the nation’s crisis, but also on ensuring that more of that supply is located in neighborhoods that lead to better opportunities for residents and communities. Local leaders across the country are finding ways to tackle these challenges; not just one jurisdiction at a time, but by aligning municipal, state and federal resources at a regional scale. Local leaders across the country are finding ways to tackle these challenges; not just one jurisdiction at a time, but by aligning municipal, state and federal resources at a regional scale. This is critical: the four regions participating in the Brookings Community of Practice on Regional Housing Solutions are home to between 9 and 15 counties each, and between 90 and 300 municipalities. In an era of limited resources and shrinking budgets, these metro areas are pursuing collaborative regional solutions that cut across their fragmented jurisdictional landscape and bring together local leaders, metropolitan planning organizations, public housing authorities, and other community and private sector partners. Through the community of practice, participants are sharing and learning about financing tools, efforts at regulatory and zoning reforms, new approaches to leveraging community engagement and support, and models for compiling and communicating small-area data to inform policy. On that last count, each of the participating regions has recognized the foundational importance of good data and having a clear understanding of baseline needs, challenges, and opportunities. In the Chicago region, home to over 280 municipalities and 15 different public housing authorities, regional partners have recently launched the Regional Housing Solutions tool to help policymakers learn about effective responses to common problems. The tool helps stakeholders understand their housing submarkets, identify shared challenges, and consider potential interventions. In partnership with the Institute for Housing Studies at DePaul University, the Chicago Metropolitan Agency for Planning (CMAP) and the Metropolitan Planning Council, the Metropolitan Mayors Caucus (MMC) used a cutting-edge data clustering technique to identify eight distinct regional submarkets based on characteristics such as building age, household income, population growth, and local economic conditions. Drawing from previous regional studies, focus groups, and interviews with experts and local stakeholders, the partners then identified common housing problems across neighborhoods within each submarket, as well as successful strategies and best practices to address those problems. Via this accessible visual format, users can search for their community to see its housing mix broken down into submarkets and to locate other municipalities with a similar mix of characteristics and challenges. Clicking on each challenge further reveals suggested strategies and links to local and national examples of initiatives deploying those methods. After perusing the Regional Housing Solutions tool, for example, the Millers’ mayor in the northwest suburbs might decide to appoint a housing commission to help her craft an inclusionary zoning strategy, form a Land Trust, or incentivize partnerships with local nonprofit developers to boost the supply of workforce housing. Essentially, this tool is a collaboratively developed, data-driven effort that empowers local governments to respond effectively to regional trends. To learn more about this tool, as well as a similar resource in the Minneapolis-St. Paul region and how metro Baltimore is using opportunity metrics to encourage new housing development, check out this recent webinar. Watch this space in the coming months, as we continue to chronicle ways in which these regions—led by their local officials, regional planning organizations, and housing authorities—are forging innovative regional solutions for families like the Millers, moving well beyond data to increase access to regional opportunity through housing.